Ping Nam Stream is PERFECT any time of year, but we LOVE it during Hong Kong’s hot and humid summer! We hike here, and we swim here. We picnic here, and we nap on its smooth rock banks. For us, there are few other more beautiful, remote and rejuvenating places in Hong Kong! 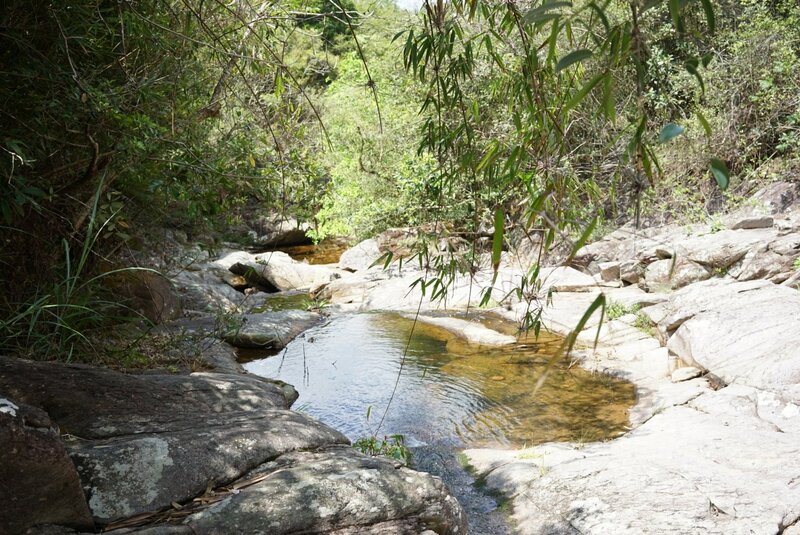 Families: Sit on the smooth rock banks of Ping Nam Stream, and enjoy a lovely afternoon picnic! Bring some swimming gear too, so you can wade in Ping Nam’s shallow pools. 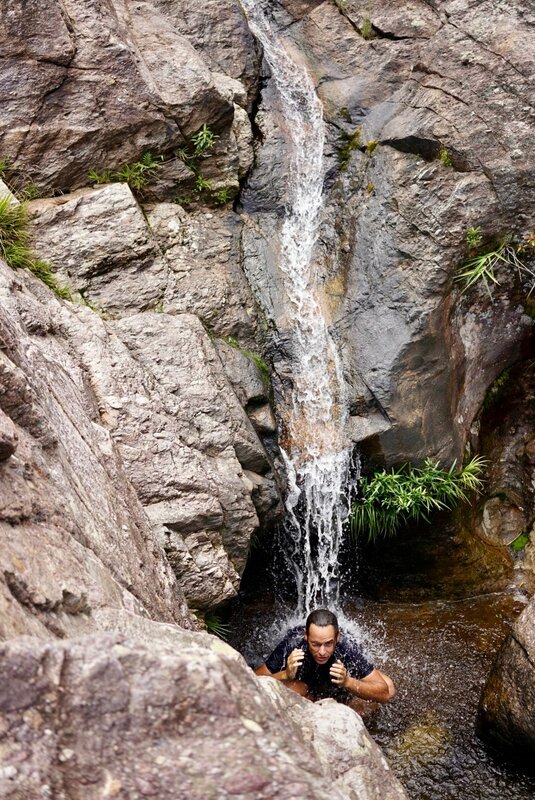 Thrill Seekers: Try your hand at scrambling up the rocky banks of Ping Nam, jumping into its deeper pools and enjoying a day of exploration in one of Hong Kong’s most remote wilderness areas! Lovers: Looking for a beautiful and quiet spot for a romantic picnic? There are plenty of places along Ping Nam that are perfect! Bring your favorite foods, a comfy blanket, and plan on an outing that you’ll remember for a long time to come! 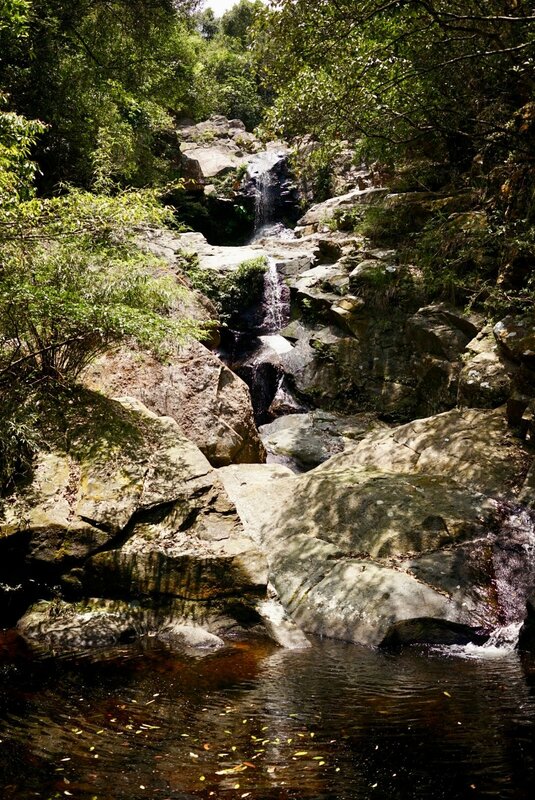 Whether you’re looking for a thrilling adventure travel experience, or something a little more tame Ping Nam Stream is a GREAT place to experience year round! We love it in the summer for the water features, and we also love it in the fall and winter when you’ll seldom see another soul on this remote trail. 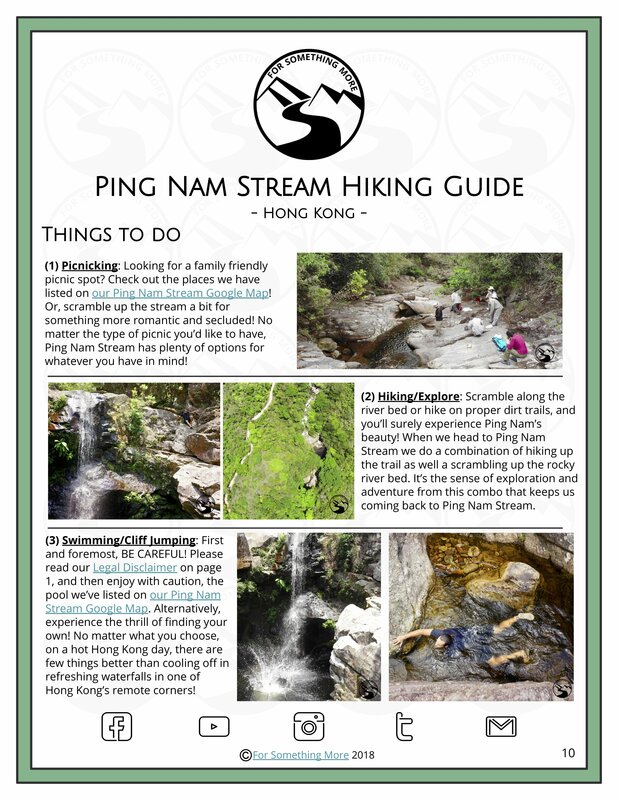 Plan Your Own Ping Nam Stream Adventure Today! 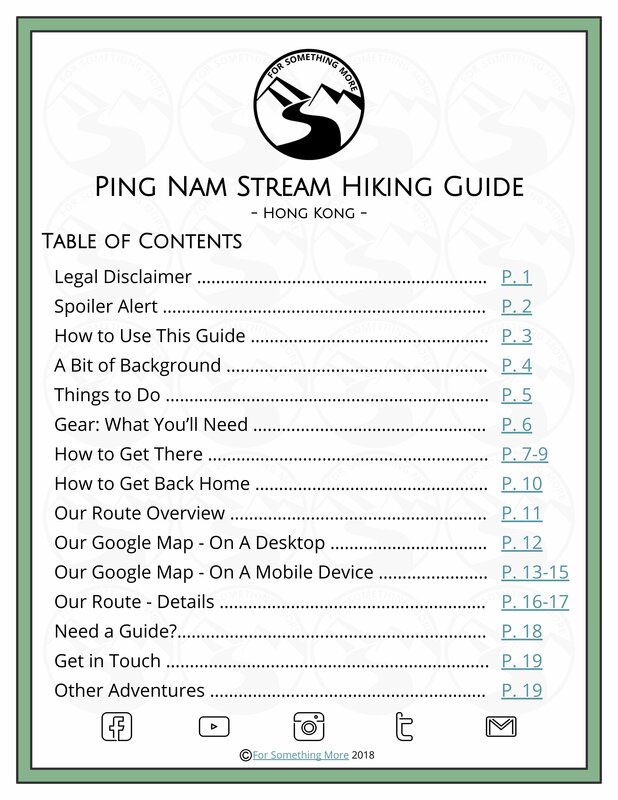 Get this US$3.00 (~HK$24) PDF file to read on any device, and start planning your own adventure to Ping Nam Stream TODAY! Download this PDF to your phone or tablet. 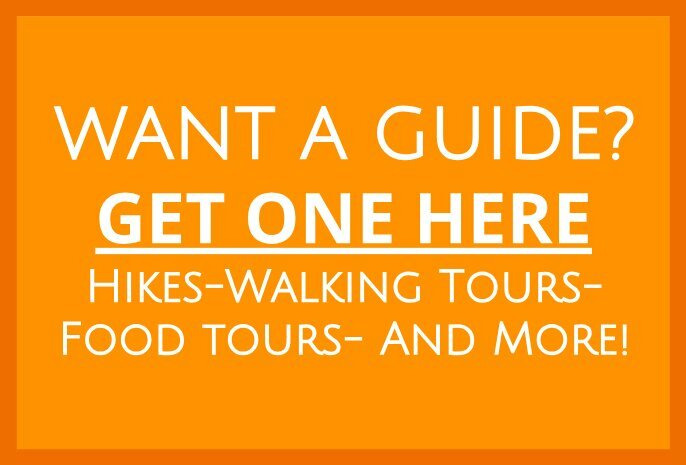 Then, you can access it without WIFI/service when you’re out on the trail! 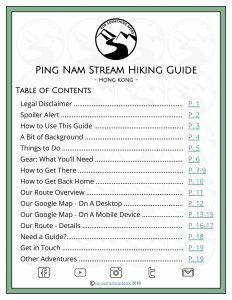 Use the numerous links in our guide to: (1) access our Ping Nam Stream Google Map (2) access directions to and from the trail head (3) access annotated maps of our route and (4) access our tried and true Ping Nam Stream gear list! 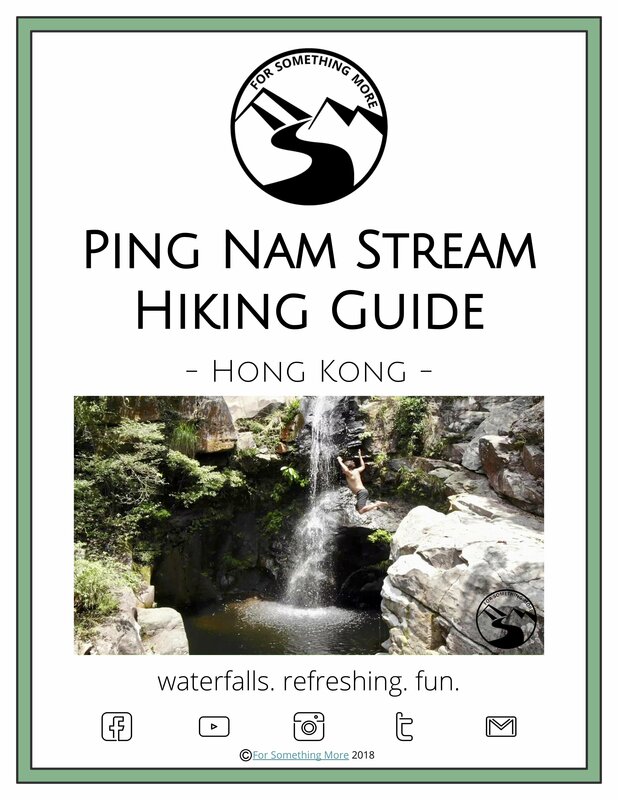 What’s In Our Comprehensive Ping Nam Stream Hiking Guide? Our Ping Nam Stream Hiking Guide is a 21 page color PDF document that covers everything you’ll need to make sure you get the most out of Ping Nam Stream, and to make sure you don’t miss anything it has on offer! Instructions on how to use the map when you’re out on the trail. Directions (with pictures and Google Maps route links) to the trail head. Directions (with pictures and Google Maps route links) on how to get back home. Things to do at Ping Nam Stream. A annotated map of our route. An elevation profile of our route. 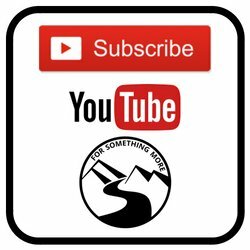 Have a look at our Things to Do page and Table of Contents. Go Get Swimming, Hiking and Picnicking! Well, there ya have it! 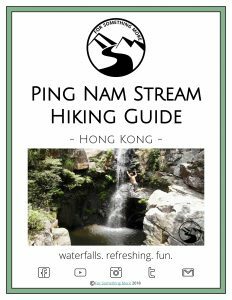 If you’re keen to experience Ping Nam for yourself, buy a copy of our Ping Nam Stream Hiking Guide, and craft your own off the beaten path Hong Kong adventure! If you’re looking for something else adventurous to do, why not consider hiking the Mountain of 8 Immortals: Pat Sin Leng or Suicide Cliff in Kowloon? If you’re keen to experience Hong Kong, and you like delicious food too, check out our Hong Kong Soul Food Guide, or have a look at our guide to one of Hong Kong’s most authentic Dim Sum restaurants! What ever you do, leave us a comment below letting us know what you think about all of this! I am ready to take a vicarious hike?? ?